As always I would like to put a small disclaimer here. These are all my opinions and views on Steins;Gate, I am in no way opposing any views anyone else may have about this series. With that out of the way, let’s begin. Such a powerful quote, from an anime at least just as powerful. It’s one of the many wise quotes featured in the excellent time-travelling tale called Steins;Gate. It is a story praised by many, and I think the show is definitely worthy of all its praise: it’s an excellent piece of work. Steins;Gate is, in essence, a unique anime. Steins;Gate is about Okabe Rintarou, a “mad scientist” who spends his time hanging out in his laboratory with his friends Mayuri and Daru. Occasionally, they manage to invent futuristic gadgets, though these are never worth mentioning. The first few episodes may turn you down, as it seems like your general slice of life/comedy anime. However, when their most interesting invention, the Phone Microwave, turns out to be able to send text messages through time, everything changes: the text messages sent to the past have a huge impact on the present. When Okabe, in a horrifying way, finds out about an evil organization called SERN, and their ways, he is forced to use time traveling methods to prevent from getting captured – and stop their plans. This (around episode 9) is where the amazing Sci-Fi thriller fires up its engines and puts the viewer on the edge of their seat. What follows is a fascinating (somewhat complex) plot, which manages to blow your mind each episode. Steins;Gate is not just your generic time traveling show; the plot is executed perfectly. Hardly ever before have I encountered such a well thought through plot as featured in Steins;Gate. The show features several jumps in time but still manages to keep the viewers’ attention without confusing them. The pace present in Steins;Gate is not lacking either – in fact, from episode 9 onwards the show holds a perfect pace. Piece by piece, the mystery of the events that happen is unveiled, working towards a fantastic, satisfying ending. (Which is very rare, especially for a show with such a complex plot) Story – and plot-wise, Steins;Gate is pretty much an unprecedented piece of art, and I think it might stay so for a while. 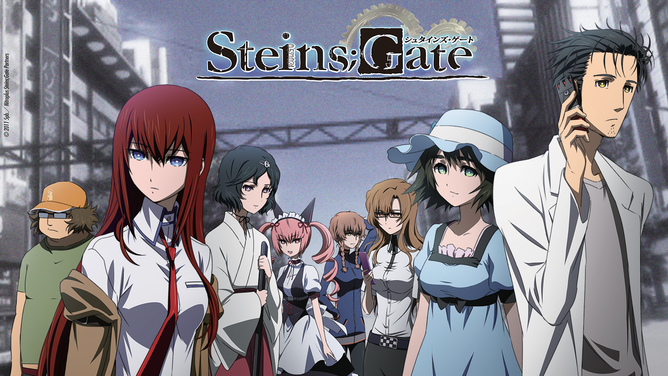 Steins;Gate is one of the few shows that manages to score a 10 on enjoyment for me. Like most people, I found Steins;Gate hard to get into, as the first few episodes don’t cover much of the plot. However, once the engine got running, I was hooked. I couldn’t refrain myself from watching episode after episode, slowly crawling to the awesome ending ahead. And I think most people would; as the plot is set up in such a way to keep you hooked each episode. If you are a fan of Sci-Fi, then you will surely enjoy this anime – but that’s not a necessity. Steins;Gate is an anime that is very likely to keep you hooked. So go ahead, you won’t waste your precious time. In fact, you might want to go back in time to watch it again! The only issue I had with this anime is that later on, around episode 16 or 17 I think, the plot slows down big time. This was a major turn off for me and almost drove me to drop the series as I am a sucker for epic plot development. I pushed through and I do not regret it. I thoroughly enjoyed watching Steins;Gate even with the little issues I had with it, and have gone on to force it on some of my friends, needless to say that they loved it. Steins;Gate is a masterpiece of an anime, beautifully crafted and with an intricate story. Many Sci-fi shows have the issue of how they handle the concept of time travel, however like Doctor Who, Steins;Gate creates it’s own theory about time travel and conveys it in the most clear way possible. Regardless of the number of time jumps and alternate time lines the anime jumps to and from the viewer always has a clear idea of what is going on and how the time travel works. I cannot stop praising the time travel in this show. Characters were amazing, to name a few of my favourites would be to name all of them, as all of the characters were equally developed and lovable. However in terms of character growth, I would have to say that the two leads, Okabe Rintarou (Sorry I meant Hououin Kyouma) and Makise Kurisu. They both change tremendously in the show whereas best girl Mayushii (fight me) stays as her adorable self. I had decided not to watch Steins;Gate 0, however writing this review and delving back into Okarin’s brilliant mind has convinced me to give it a shot.